1. The homegrown kind like John Doerr of Kleiner Perkins. Doerr (Forbes' 2012 net worth=$2.4 billion) was on the leading edge of the evolution of the venture capital industry and this is mainly what he has done, mainly what he is. 2. What I'll call the "exit entrepreneurs" who provided a huge multiple to their VC investors and then took up these same VCs on a quick offer to try their hand at VC investing or become what VCs like to call an "entrepreneur in residence." What that really means or what these characters really do, I have yet to find out. Think Vinod Khosla (Forbes' 2012 net worth=$1.3 billion) who was one of the Sun Microsystems' founders before starting a long and profitable tenure at Kleiner Perkins. 3. The 'techie' or IT engineer who becomes a VC as a result of his background in technology or starting a technology company which successfully exited then being reeled in by one of their VC firms. Marc Andreessen is a good example of this kind of migratory journey. After founding Netscape, Andreessen had a few more start-ups and then started his own VC firm, Andreessen Horowitz. Although he qualifies under both #1 and #2, I think of him chiefly as the kid who invented Mosaic at the University of Illinois. It is #3 which also spawned a most interesting Silicon Valley VC, Steve Jurvetson of Draper Fisher Jurvetson (DFJ). This gregarious technologist has a number of significant previous tech employers to his name as well as broad an understanding of IT as anyone I've ever encountered. Semiconductor, software and increasingly massively parallel computing are his fortes but don't sell him short on all the other IT and IT-related sectors--he's knowledgeable at the highest levels across the board. Perhaps this is the simple key to success in tech investing: understanding how everything works first. And Jurvetson just keeps on evolving; getting interested in new things, always learning. electronics, nanotechnology, clean and biotech are all now--and have been--clear and deep investing interests for him. Sitting on the boards of diverse companies such as Tesla Motors, SpaceX and Synthetic Genomics, Jurvetson pursues his tech interests like a heat-seeking missile. Coming in at #69 on Forbes' sought-after "Midas List," Jurvetson has a solid reputation for rising above all others in an organization before any others knew what hit them. He finished his Stanford undergraduate engineering degree in two and a half years and was #1 in his class. Staying on to burn through more Stanford degrees (M.S. Electrical Engineering and MBA), Jurvetson has a mind like a steel trap. 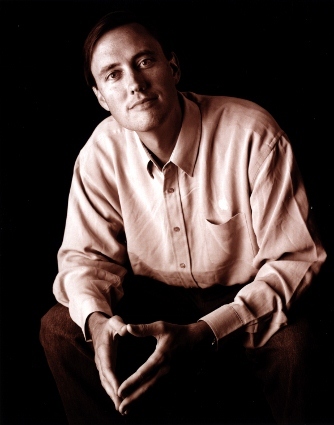 Hewlett-Packard was Jurvetson's first job out of Stanford, working there as an R&D Engineer. Jurvetson acquired many specific technology capabilities in the two years he disrupted things at H-P, again proving his uniqueness. Then, two stints in marketing at Apple and NeXT, gave Jurvetson a solid technology pedigree for such a young man. Wunderkind Jurvetson then joined Draper Fisher Jurvetson after his second year of Stanford Business School and again, made his way upward in rapid fashion. As before, Jurvetson sped to partner and having his name etched on the front door within six months of joining Draper and Fisher. Hopefully, Jurvetson will never go into politics. Enough of Jurvetson's stellar background. What's he doing now? As I've learned over the years of watching him speak at conferences, reading about him and and heard from entrepreneurs he's funded, Jurvetson is just a rare and special man--a big-brained polymath to be sure--but when you talk with him, when you sit with him, he is just another guy interested in technology. One key Jurvetson differentiator: He talks faster than the average human being--much faster. A prime example of this uber-hyper-speech 'Jurvetson-ese' is in a Google talk he gave entitled, "Meaningful Innovation: Whether to Design or Evolve?" This talk, was a 120-minute presentation given in 71 minutes; I kid you not. The noticeable differences between Jurvetson and many of his peers are threefold: 1) He's accessible; you can get to him for the most part. I think he makes it this way purposely. 2) He listens once you get his attention (and it's not all that hard provided you have a rock-solid tech idea) and 3) He takes very calculated, very well thought out chances, risks. I like these three distinctions because they are rarer than people think. However, the overarching difference between Steve Jurvetson is that you will probably like him. He's a likeable guy right off the bat. In my experience, there's not too many VCs that people can take an immediate shine to but Jurvetson is certainly one. I had a couple of wild, frenetic Tech Chats with Jurvetson over the last several months. "We're entering an era where progress will be unprecedented," he started off with a twinge of ominousness and rising excitement. He just let that statement hang in the air for a moment and sink in. "Using Moore's Law as a proxy, the past 20 years is like the next year." 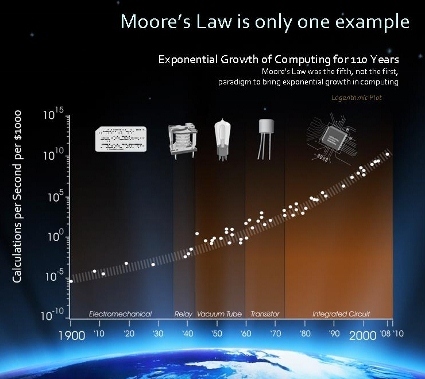 Jurvetson likes Moore's Law and more importantly, Ray Kurzweil's amended slide version which Jurvetson always includes in his presentations and chats. "Here's an anchor point. The only prediction one can make over the next 40 to 50 years," Jurvetson told me, "is progress will be disruptive; Moore's Law will continue to be true; 'Black Swans' will proliferate; and forecasting will be impossible. Incumbents are increasingly unsettled and there's a rapid, and disruptive fractal effect." Damn, how then will VCs make any money--or will they still exist? Without predictable ways of making money, I think to myself, or those that don't involve high risk (which VCs are hyper-averse to) will anybody even be a VC in the future? Jurvetson gets me off my imaginary high-horse by assuring me that while there may not be VCs the way we think of them these days, there will still need to be investors of some kind to help the idea people start companies. Phew!--that was a close call. But Jurvetson does add, "This future scenario will make investment impossible ... well, perhaps not impossible but it does argue for having a portfolio that says, 'I'm not too smart.' It's very hard to be certain." Steve Jurvetson could quite conceivably riff on forever and it's this ability which makes a conversation with him so much fun but hard for note-taking. When asked about Nanotechnology, he said, "As we look back on nanotech investing over the last 10 years, I've been looking for interdisciplinary advancement in the sciences. Nanotech is a very interesting place to look for breakthroughs in science ... you see great conversations about innovations ... interdisciplinary innovation is so fascinating. It's a bit like saying 'I'm in Thermal Dynamics;' nobody is in Nanotechnology." "In the semiconductor path," Jurvetson went on with wild excitement, "we build things from the top down--we build disk-drives like this too--we make things people care about but just keep miniaturizing. Carrying right on through several vertical markets, Jurvetson said, "In chemicals, Synthetic Genomics is one of my real loves. Started by Craig Ventner, known for sequencing the first human genome, my firm DFJ is a Series A investor." Jurvetson is also on the Board of Directors of this "Jetsons"-like company looking to take quantum leaps forward for humanity in the production of food, water and medicine amongst other staples of life. IDT (Integrated DNA Technologies) is another of Jurvetson's faves; though he "just missed out" on investing in them, he told me sounding a little dejected. "The economies of the future are information," Jurvetson told me, "Monsanto is mainly interested in food products but the research was incredibly slow. Now we have an eight-day turnaround on groundbreaking research; Biotech has helped tremendously with hunger and the world food supply." Then, Jurvetson stayed on topic but ratcheted up the conversation immensely. "50 years from now, everything should be a dollar a pound. A block of wood shouldn't be more than a block of iPod." Hmmm ... that was a cerebral moment. "Everything should be a dollar a pound and we should only pay more for software and entertainment," Jurvetson delivered the knockout punch. One of the childhood memories of sheer joy and fascination that Jurvetson and I share is model rocketry. I used to spend hours making different, new and more advanced rockets and plot their course from a field near my Westchester house. Where they would go; where they would land; and what their payload would be was all part of the process, the fun of discovery and unpredictability. After discussing this briefly during our Tech Chat, Jurvetson shared that he had some Estes rockets in his office right as we spoke--he shoots them off with his son at every opportunity. His "Rocket Launches" collection on Flickr is quite impressive. Jurvetson gave a TED talk about rocketry where he not only spoke as fast as some of the rockets went but also displayed a Dean Kamen-like interest in how kids might learn physics and math from this weekend hobby. And this segues quite nicely into another of Jurvetson's core interests: Space. Elon Musk is a tech stud. The co-founder of PayPal is worth upwards of $2 billion according to Forbes. But money is not Musk's main focus nor is it Jurvetson's, by the way. Both of these laser-focused men are after bigger game such as proliferating electric cars and conquering outer space with commercial/entrepreneurial enterprise solutions. And Musk has been spending a lot of time with Steve Jurvetson. Draper Fisher Jurvetson was an early investor in both of Musk's recent creations Tesla Motors and SpaceX and Jurvetson occupies a board seat at both companies. The late Sir Arthur C. Clarke and Vint Cerf have both worked with NASA and JPL in the ongoing effort to explore and bring Earth humans and our vehicles to other planets. Clarke told me during my SKY News interview of him in 2003, that "we have already outgrown our planet and we are forced to look for other homes not just in the future but right now." Cerf has told me similar things during our interviews. So what to do with the decommissioning of the Space Shuttle program and economic woes that preclude the kind of massive government investment that landed us on the moon? Enter Internet billionaire Elon Musk and tech investor/rocketeer Steve Jurveston. Started in 2002, I remember thinking, "yeah, right" when I heard of what I thought was an absurdly futuristic folly, SpaceX. Well, it is I who was absurd. SpaceX has already developed 'launch vehicles'--the rockets that send up the cargo or human payloads and on May 25th of this year became the first commercial company to deliver cargo to the International Space Station (ISS). Musk's vision, in 2002 and before no less, to privately commercialize space travel couldn't have been any better timed or have any greater impact. "SpaceX made incredible progress," Jurvetson said pointedly, "it created reusable rockets, docked with the ISS--this was tremendous work. Only three or four countries have ever done these things." Would Jurvetson like to go up himself? "Would I go? Yes, but I'm waiting for a couple of missions. I want to go up and stay in a space hotel; flying in orbit for days and days. If you don't have to land on the moon--the most dangerous part--it's going to be so much more fun and safe. I'd take lots of pictures--it's be a zen-like experience. The cost is coming down rapidly." Jurvetson kept right on barreling like a runaway train with a sleeping conductor, "Right now, SpaceX has more than $4 billion revenue under contract and the Chinese ministers of their space agency said, 'we can't compete with SpaceX.'" The business models used to build SpaceX have been crucial to the company's positioning and development. Building the vehicles to be reusable is a nice tie-in with Musk's obvious 'green orientation' and is also supported by the "in-house" way SpaceX builds, tests and markets its space services to government and the private sector. Steve Jurvetson drove the first Tesla off the assembly line; getting Tesla #1 while Musk got #2. I asked Jurvetson about how he aced out the Tesla founder and he told me a neat vignette. "People were writing checks very early to get one of the first Tesla sedans when there was just a hint of a sedan coming out," Jurvetson started off cagily, "but Elon had stated that the first person who wrote a check after the price was officially set on the sedan would get the first one off the line. A while later, I was sitting in a Tesla board meeting and raced ahead in the board deck and saw the price was being set. I whipped out my checkbook and wrote Elon a check right there. 'Well,' Elon said to me, 'I guess you get car number one.'" Do you always drive your Tesla? "Yes, I drive it every day; I'm an Evangelist for electric cars," he responded cheerily. But Elon Musk is only one of Jurvetson's pals who's doing big things; if there's one thing that's true of Jurvetson is that he gets around and knows many people with big ideas. And he likes it this way; he seems calibrated for meeting and analyzing as many people as he possibly can. Pick one recent investment that excites you the most? "Only one? ... gee, that's tough. OK, it'd have to be Rethink Robotics a company started by Rodney Brooks from MIT. DFJ made a Series C round of investment in them." Jurvetson's best exit? "Hotmail (sold to Microsoft for a reported $400 million in 1997) was of course our earliest big win. Interwoven (NASDAQ IPO 1999 then bought by Autonomy 2009) was very successful and there was Skype (bought by eBay in 2005 for $2.6 billion then again by Microsoft in 2011 for $8.5 billion). But in terms of sheer dollar return, DFJ owns 38% of Baidu (NASDAQ: BIDU) and has never sold a share. (Last share price of Baidu=$120 p/s with a $42 billion market cap.) We've made 1000x our money a number of times," Jurvetson said almost as if making lots of money was not his central goal in investing. In addition to the Jurvetson identifiers I've listed throughout, we now have a final, macro difference between Steve Jurvetson and the other VCs running around seeking their perpetual 'deal flow' and that is: Jurvetson is after more important investing opportunities. He wants to change the world. Whether it be by funding the world's first successful electric car company and having a massive impact on reducing air pollution to helping mankind escape the Earth's gravity to new planets, Jurvetson is seeking to make a real difference ... and there are not too many VCs doing that today.